So, the idea was to gather together a group of people to talk about how and why they focus upon infrastructure in their research activities. In short: to form a temporary infrastructure of knowledge exchange, of intimacy even. And this is what we achieved at the recent SHU Space & Place Group conference. I’d hoped that we’d presence the often backgrounded infrastructures that enable social life but I think we also got a bonus too, a glimpse of the human within infrastructure: both in terms of a fundamental dependency, but also as an authorship, and fellow-travelling. Infrastructure is of-us and we of-it. As Paul Graham Raven reminded us at March’s taster event, for Donna Haraway we are already cyborgs, beings melded with technology, whether we like it or not. Richard Brook (Manchester Metropolitan University) picked up this theme in his opening presentation. As an architect he’s interested in how infrastructure is a mega-object emplaced into the environment with varying degrees of explicit attention to design and context, versus the compulsion towards function-determining-form. Helpfully he showed how attitudes towards the formation of infrastructural objects and their networks have fluctuated over time: in some eras infrastructure has been the subject of presencing, or ‘fitting-in’ through design (i.e that the host society has foregrounded it, perhaps as a sign of modernity and progress) whilst it has been the subject of less concern and consideration in other eras. But in most eras design focus and appreciation of environmental ‘fit’ has still tended to follow a “view from the road” rather than a “view of the road” approach for most infrastructure which we travel or inhabit. We are supposed to look out from not look at infrastructure. Then we shifted out attention to infrastructures of power generation and supply. Will Eadson (SHU) outlined his research into the politics of district heating networks, reminding us that each element of infrastructure is owned by someone, and that the interaction necessary to create and maintain a system requires a shared purpose and a mechanism of collaboration. Will pointed out how through combinations of politico-technical friction within these systems, the best of intentions can be thwarted, or rendered more difficult than their engineering or architectural designs might suggest. Martin Dodge (University of Manchester) turned our attention to a historical perspective, by outlining his work researching the now-vanished 20th century network of power generation and supply in the Bradford area of north-east Manchester. He showed us how through archival searching he has pieced together a sense of the scale and purpose of the colliery, power station, gas works and abattoir that once operated as an integrated cell-like, metabolic infrastructure feeding itself and nourishing outward. But also spewing out legacies of pollution and ill health. Martin’s presentation sparked debate about whether heavy industry should be the focus of narratives of ‘loss’ and whether such foregrounding is (in any sense) nostalgic, and whether it is right or wrong to build the stories of place other than through the interview testimony of those who once worked there. Martin was open and generous in giving his responses, and in doing so indicated (for me at least) that if the aim is to presence infrastructure then the presencing of the researcher (and of their motives and feelings about what they have chosen to research, and why) is a very important – but often hidden – part of the story. A copy of Martin’s slides can be viewed here. After lunch we reconvened to hear from Fides Matzdorf (SHU) taking us through her ethnographic account of improvised infrastructures within the spaces and places of competitive ballroom dancing. Fides showed us how generic municipal spaces (e.g. town halls) are locally and individually adapted by the competitors who appropriate the ledges of memorial plaques, radiators, window fixings as improvised changing stations. Her presentation reminded us that infrastructure is fundamentally about environmental adaptations to some pressing purpose, and that spaces can be multi-use, adapted in the moment with a venue’s infrastructural (event enabling) affordances brought out by the user, rather than designed-in, intentionally by the original place maker. Thus not all infrastructural function and use is (or can ever be) anticipated by the designer. Brian Lewis (poet and publisher, Longbarrow Press) then counterbalanced the claustrophobia of Matt’s presentation by taking us outside – first through White Thorns his poetry recital, to the Isle of Axholme, the empty seeming flatlands of North Lincolnshire, where he performs long, lone night walks. Brian’s verse (extract above and more here) drew into relief the infrastructural features of that landscape – the wind turbines, the drainage ditches and the agricultural apparatus and showed himself drawn into co-occupation of space with them thereby revealing a highly populated landscape devoid of humans. Then Brian took us outside – literally – leading us out into the daylight of Sheffield for a meander past the culverted outcrops of the River Sheaf, the barren straights runs of the tram lines as they parallel the railway station and inner ring road, across a long, confined metal bridge tunnel, that few in Sheffield choose to notice and thereafter winding up through narrow lanes to SHU’s Cantor Building for a haiku writing session inspired by the walk (with some of the compositions scrolling below). Then the event ended with John Grant’s (SHU) tour of the roof of the Cantor Building, showing us its heat and power infrastructure and outlining how resilient this building would be as a hiding place in the event of a zombie apocalypse. John uses this colourful metaphor as a way of engaging students in the prosaics of assessing the energy rating of buildings – it being more attention grabbing to presence infrastructure through setting the challenge of finding ways of avoiding encounter with the flesh-failing bodies of the undead than in foregrounding infrastructure through attentiveness to the power rating plates of blank solar cells and heat exchangers. Thus, in all of the talks the power of narrating infrastructure – of knowing and presencing it for a particular purpose – came to the fore. NB: My spell checking tells me that presencing is not a real word. But it should be, and one day I will try to fully explain why. In brief, it was a term used by anti-nuclear activists in the 1980s to counter the ability of the nuclear state and its infrastructure to hide in plain sight, and involved mobilisation of a variety of representational strategies (photography, performance, writing, archival research) to make sure that that infrastructure’s footprint was noticed (see for example the work of the Atomic Photographers Guild: https://atomicphotographers.com/). An extreme instance of presencing is the spraying of human blood on nuclear facilities by the Ploughshare activists, as chronicled in Eric Schlosser’s (2015) Gods of Metal, see also: https://www.ploughshares.org/about-us. This is a forward-looking plug for Walking Inside Out a compendium of essays on contemporary British psychogeography to be edited by Tina Richardson (@concretepost) as part of Rowman and Littlefield International’s book series on Place, Memory and Affect. The book is due to be published in Autumn 2015. “The book will open with a history of British psychogeography, thus situating the current swell within its chronological context. It will introduce the terms that are often used within the field and the key thinkers within the urban walking lineage. Discussing the current state of British psychogeography, the introduction will explore the historical problems within the field, dealing with some of the contemporary detractors of the subject and will introduce the various forms of output that explorations of the city take, whether they be in film form, such as Patrick Keiller’s political and architectural films about London, or the creative literary texts of Iain Sinclair. It’s great that the project brings together a wide spectrum of ‘urban walkers’, some academic, some not. Inevitably, Tina has had to be selective and there are many others who could have been featured if space had permitted – but I think the cross section that Tina has assembled will produce a very good account of the (many) ways and purposes towards which broadly psychogeographical sensibilities are being applied in both urban studies, the creative arts and good old mind-engaged curious walking. I’m one of the contributors who has made it through to the final selection. I will now have to pull my finger out and explain what I see as the link between psychogeography and legal geography. I may even have a go at saying this out loud as my contribution to the August 2014 RGS session on Legal Geography. Highmore also speaks of Sherlock Holmes’ gift of being able to take everyday objects and to discover the stories of those associated with them. Holmes floods meaning into the seemingly insignificance of matter surrounding him – by being attentive to the banal, the elementary. Debord, G. (1955) “Introduction to a critique of urban geography” Les Levres Nues, 6 http://library.nothingness.org/articles/SI/en/display/2. “They are the real Dasein. So, I’m preparing for a trip to Pimlico; to speak at a summit about public safety in abandoned quarries and a colleague quips, “that’s ironic, ‘cos there are no quarries in London”. He has a point, but it sets a deeper thought running. Last time I went to Pimlico, I was there to visit Tate Britain. The treasures inside were all very well, but I was equally transfixed by the vast white elevation of building’s exterior – that Portland stone and its shrapnel marks, a testimony to a nearby instance of the Blitz: the smoothness of that surface ruptured by pock marks, revealing the granularity of the exposed quartz grains within, glistening in the low summer sun that day. So, as distraction from packing for my trip – and as a modest contribution towards Bruno Latour’s exhortation that we must “search for the missing masses” and challenge the “oblivion of things” (Olsen) in social theory and research informed by it, I started to sew together some thoughts about the fate of stone within Pimlico, and specifically its pavements. But whilst building stone may – by these component names (Portland; Corsham; Aberdeen Granite) – be vaguely familiar to us, they give a misleading impression. For the bulk of stone summoned into city was actually consumed in its highways and pavements as sub-base, setts, kerbs and gutters. As a case study in the fate of its road stone, Samuels shows how Aberdeenshire’s first paving contract with the City of London was made in 1766 and by the 1830s London was already a major outlet for the district’s quarries. Yet of the 36,352 tons of stone sent down to London in 1831 only 143 tons was for use as building stone: 3,137 tons were for pavements and kerbs, and 33,072 tons for ‘carriage way’, these stones (setts) being supplied in six size grades. Key London thoroughfares were prominently laid with Aberdeen setts in the 1840s, including London Bridge, Cheapside and Moorgate, before the harder Mountsorrel stone (from Leicestershire) first trialled at Euston in 1843 came progressively to dominate as the carriage way road stone of choice for the increasingly trafficked inner city (before, in time, Mountsorrel was itself eclipsed (or at least overlain) by the less elegant but more repairable tarmacadam method, and its voracious and indiscriminate appetite for crushed stone for its oil- meets-rock matrix). And so the city grew and grew. It also adapted. The roads and pavements accommodating to sewer laying, distribution networks for electricity, gas, telecoms, the arrival of tram tracks, the removal of tram tracks, the expansion of networks, the renewal of networks, fibre optics and broadband, traffic control technology. With each iteration the roads and pavements were cut into and patched up – space ebbing and flowing, made in the conduits beneath: a proliferation of colours, angles, agencies and layers of churned and re-compacted subsoil, stone, metal, power, water, waste: the life blood and bile of the city. Picture throbbing capillaries pulsing liquid, heat and information instant by instant beneath the busy street and its Aberdeen granite jigsaw. 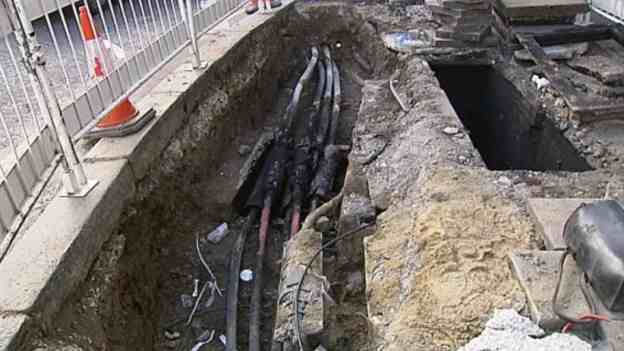 Then – on 25 April 2013 – at the corner of Pimlico Road, outside an antiques shop, brooding and miscontent beneath the pavement – a power cable explodes, a flash forcing up pavers and ungirded power into the day: unchained energy violently seeking out earth through sky, and escaping from the thrall of 1,867 denied users. This strange incident then proliferates (a meme spreading through the networks, coursing through the city’s ventricles), a multitude of iterations of this video and a new found anxious regard for the safety of pavements and all that normally silent stuff that lies beneath. And subsequent reports tell us that such eruptions are not as uncommon as we might expect: 8 in 2011, 29 in 2012 and 12 in the first 6 months of 2013 according to the Health & Safety Executive (LBC). …[they] are all [normally] within reach. LBC (2013) ‘New Threat to Londoners: Exploding Pavements’ www.lbc.co.uk, LBC 97.3FM. Olsen, B. (2010) In Defense of Things – archaeology and the ontology of objects, Alta Mira Press: Plymouth. Video of explosion – filmed by local resident Charlie Brook and uploaded to Youtube. I now close this outcrop trilogy with a multi-site rumination on the imperviousness of granite. Granite always involved a journey inland, and a negotiation too. Growing up in a household without a car it was always a convoluted trek to Dartmoor to commune with its stout grey sentinels. It would entail finding a spare seat on the extended family’s convoy into those hills. But the relative difficultly of reaching these rocks added to their lure. To be there, amongst them was to be somewhere made meaningful through its relative unattainability; special through a (modest) trial and ordeal. Whilst barely 30 miles from my town, these bulbous grey mica flecked outcrops felt regional, rather than local. I hold cherished memories of actual visits, but the yearning to visit was always stronger than the specific memories of actually being there. In melancholic moments the image of being up amongst these windswept peaks was a strong one. A wished for recuperative: something to blow the cobwebs away, to recharge the batteries, to fill a hole. Granite sits and broods, squat and strong, its forms asking to be clambered upon, pored, investigated. But it doesn’t give much away. It leaves you to speculate. 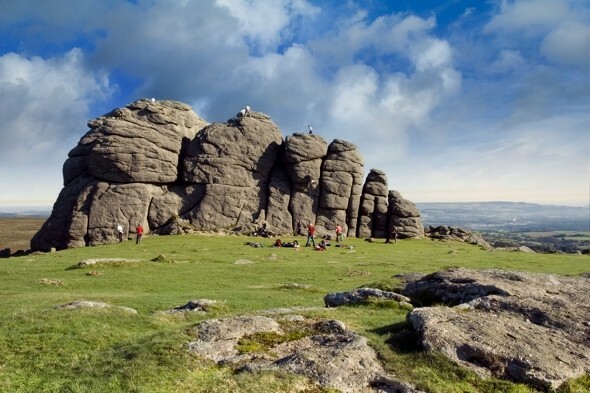 Unlike the perishing, unstable and ubiquitous rocks of Torquay, granite has a resolute firmness and mystery. And there is something sinister in granite’s sly Easter Island faces: a silent leeching of radon from its radioactive pores, that gas seeping into basements, slowly poisoning unventilated air and bringing 1,200 lung cancer related deaths each year in the granite zones across the UK (Laurance 2010). A slow, silent-but-deadly, rock fart. 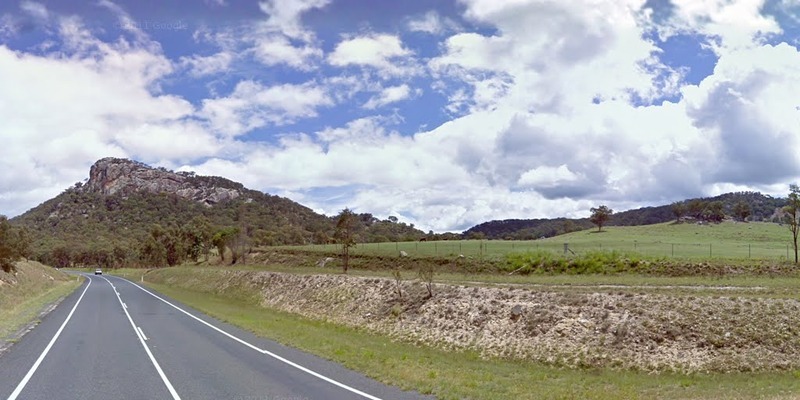 Kristina Schlunke’s Bluff Rock (2005) is an account of her attempt to investigate an 1844 massacre of aborigines atop a local granite outcrop close to her Australian outback childhood home. Schlunke ‘s research ranges across contemporary accounts, wider cultural context and the material conditions of the event-space. The rock itself is offered up as a mute witness to whatever happened there. For Schlunke preoccupations of the present inevitably seek to project onto any attempt to interpret the past. She sees the urge to order and make sense via selection and narrative as something to be – if not resisted – then at least laid bare. In that sense her investigation becomes resolutely autobiographical and deconstructive. The outcrop itself is presented as resistant to this ordering, resistant to the writing (or revealing) of the ‘truth’ of the event. In the swirl of interpretations, Schlunke clambers to the top of Bluff Rock and finds there no plateau, no clearly defined edge from which the cornered aborigines could have been ‘thrown’ (as in the testimony of the perpetrators). Schlunke is not seeking to deny the atrocities of colonialists and their actions against those already inhabiting the supposed Terra Nullis, but she finds threads that cannot be neatly assimilated into any of the circulating accounts. She concludes that the massacre probably did take place – once amongst many in this locality – but probably not at this landmark, that scenery having been added later, as though the event required geological ‘sexing-up’, bringing in a dramatic staging point, a crescendo for the endemic casual violence of such frontier encounters. Schlunke notes the instability of the very naming of Bluff Rock (and of the colonial urge-to-name as part of territorial conquest). An early – rain soaked – explorer came upon the outcrop in a wet July and declared it ‘St Swithin’s Bluff’. That name didn’t stick, but – as for Schlunke – “This combination of rain and rock and the figure of a man’s body open to the elements and the effect of other men, creates a very nuanced image of that first ‘owner’”. Likewise Matthew & Michael Makley find something similar in Cave Rock (2010), their account of the disputed use of a Nevada lakeside granite mass, the remnant of a volcano that erupted there three million years ago. To the local native American Washoe tribes this outcrop is “De’ek wadapush” (Rock Standing Grey), to the white explorers who then sought to style a name for this landmark, it was variously “Rocky Point” then “Indian Rock” and then “Cave Rock”. The Washoe detoured to avoid this place. It was a potent place, to be visited only by shamen and at which secret rituals of re-powering would be performed, sometimes for good, sometimes for ill. But then in 1859 the white man’s gold rush saw a plank bridge-road skirt the edge of the mass. Then in 1931 engineers blasted a road tunnel straight through it (with a second tunnel added in 1957). The Washoe were not consulted. Granite comes in many shapes and textures, but is often notable for its sheerness. As Schlunke puts it: “only straight, downward fissures and the simple immensity of granite”. Cave Rock was of a formation not well suited to traditional crack system based climbing, but the pioneering of bolt enabled sport climbing in the 1980s opened up the possibility of sheer rock faces to climbing. You don’t need cracks, seams and crevasses if you have runs of metal bolts fixed into a face. “When I finished ‘Psycho Monkey’, I looked to the right and saw the line of ‘Phantom Lord’, which was harder [5.13b]. When I finished that, I looked to the right again and saw…the line of ‘Slayer’…I yelled to my belayer to lower me, and ran over to start working on it.” (quoted in Makley & Makley, 2010). The climbers’ interest in Cave Rock coincided with emergence of a (slightly) greater attentiveness to Native American affairs in US Federal policy, sparking long debate amidst Cave Rock’s custodians, the US Forestry Service, about how the seemingly incompatible uses could be reconciled. The Washoe wanted all non Washoe use of Cave Rock to be banned. In retort the climbers developed a triple pronged argument, first that US constitutional law prohibited the Forestry Service from acting in a way that promoted the interests of a religion. Secondly, that the spiritual integrity of Cave Rock had already been erased by the road tunnels and thirdly, that Cave Rock now held a rich spiritual meaning for climbers too (hinting at an equivalence to that of the Washoe). 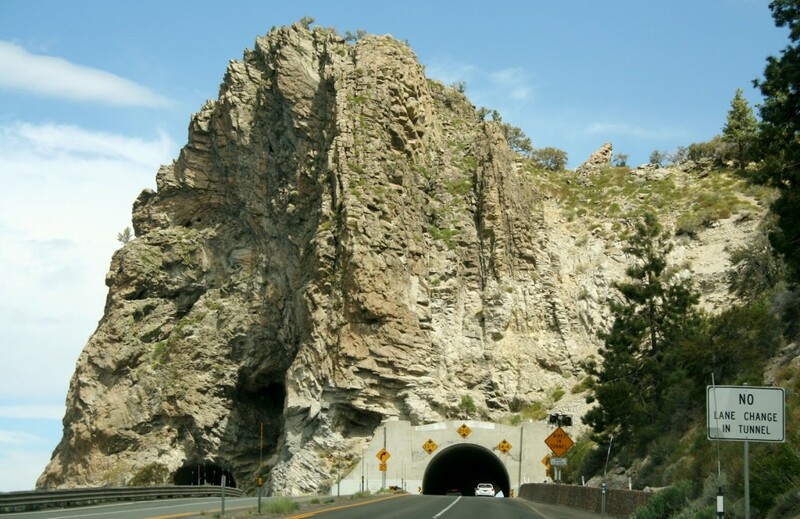 Meanwhile – to add to the messy reality and multiple meaning making in play at this site – Cave Rock had been designated as a Federal heritage site due to its historic transportation significance: the road tunnels! Sadly, the dispute remained one largely polarised between the climbers and the Washoe, the vision of a march upon Cave Rock by an enraged mob of access defending road tunnel enthusiasts never materialised. Ultimately, after some extensive to-ing and fro-ing the Federal Appeal court decided that it was lawful for the US Forestry Service to ban climbing at Cave Rock without falling foul of the US constitution. The rock’s heritage value for the Washoe (and the general population of the area) could be acknowledged , and climbing upon this publically owned land could be prohibited as of deleterious character to the integrity of the rock itself. Subsequently, the climbers bolts were removed, their holes plugged and the climbers flooring works taken away too. But Cave Rock remains publicly owned land, it has not been repatriated to the Washoe, and traffic still streams through the tunnels. What the granite thinks of all this is not known. Laurance, J. (2010) ‘Radon Gas: the silent killer in the countryside’, The Independent, 10 August. Makley, M.S. & Makley, M.J. (2010) Cave Rock – climbers, courts and a Washoe Indian sacred place, University of Nevada Press: Reno. Schlunke, K.M. (2005) Bluff Rock – autobiography of a massacre, Curtin University Books: Fremantle. This blog-essay is about everyday soundscapes, what causes them, how they can be charted and why and how they disappear. I too caught a brief aural glimpse of Sheffield’s dull industrial thud when I first arrived here a decade ago. Early, on still summer mornings, already half awoken by vicious sunlight streaming through thin curtains, I would be fully roused by the kicking into life of the last remaining drop forge down in the valley. In response I bought blackout curtains and secondary double glazing. But still this behemoth found its way to me, the sheer force of this power press’s vibration through the neighbourhood’s ground and onward into the fabric of my home and the soft tissues of my head. After a couple of summers of annoyance the forge closed and eventually its structures were demolished. The site now sits empty and weed ridden, a scrub-gap between the local KFC and B&Q. Listening again to ‘Almost Medieval’ a few weeks ago got me thinking about the soundscapes of my own past, and of their unattainability. The Human League portrayed their imagined trip back in time as considerably less than pleasurable. But it is the alien quality of the experience (rather than its repulsion) that intrigues me the most. In response to the song I recall a soundscape experienced from my childhood bedroom. A sound finding its way into that room via the windows. A particular set of sounds – cars ascending a gentle rise, driving up the valley in which my suburban home was situated. A particular car and engine tone, a particular interaction of rubber on tarmac, a particular reverberation of that sound within the funnel of the valley. This was all delivered into my bedroom until we got secondary double glazing (and a few years later proper double glazing – the old ‘crittall’ metal single glazed frames having finally been removed). On the arrival of these enhanced interfaces, those sounds faded from the sensory experience of being in that room. Only on summer days with the windows open would that outdoor soundscape tentatively venture inside again. So, I started wondering whether – if I went back to that house now and opened the window – would I hear that soundscape again? 1) As we age our hearing capabilities change. The range of our hearing recedes. Only the truly young can hear into the high pitch spectrum. So, if I went back now there are acoustic fractions of the soundscape that I simply could not register anymore, no matter how much I might want to. 2) Cars have changed. So have their engines and the petrol inside them. Lead free fuel burns differently, engines are more powerful and the gentle rise is now achieved in lower gear than that prevalent in my childhood. 3) There are more cars. There would be more traffic noise. A more complex set of sounds than the lone small car that I nostalgically imagine drifting past my window. 4) The arrangement of gardens has changed. Many of the front garden trees have been removed to create car ports. Those that remain are bigger. Back gardens are now more paved, and the pigeon lofts at the top of many of them when I was young have decayed into nothing. All of these factors would result in a different echo profile for the car-sounds within that valley. 5) Extension of the surrounding suburbs has reduced the proximity of that street to the countryside, resulting in fewer birds and their song (and less variety of those birds that are still there). So, those sounds, and the environment that combined to produce and propagate them, have gone. Travelling in space to the place where those sounds once were will not achieve rediscovery of that soundscape, even if the double glazing is removed, or the window flung open. These then were the sounds of the Seventies, a product of a moment in time and its physical (and human) parts. I recall also that there was a portion of that childhood soundscape that came only at night: Concorde’s sonic boom as its shot overhead Atlantic-ward. Unlike the gentle rumble of suburban traffic noise, the arrival of the sonic boom with the launch of Concorde’s supersonic trans Atlantic service from 1976 proved to be a very public, and hotly debated, development in the national soundscape, and noise pollution came to be THE pre-eminent environmental issue for much of that decade, before declining subsequently to its more recent ‘cinderella’ status. 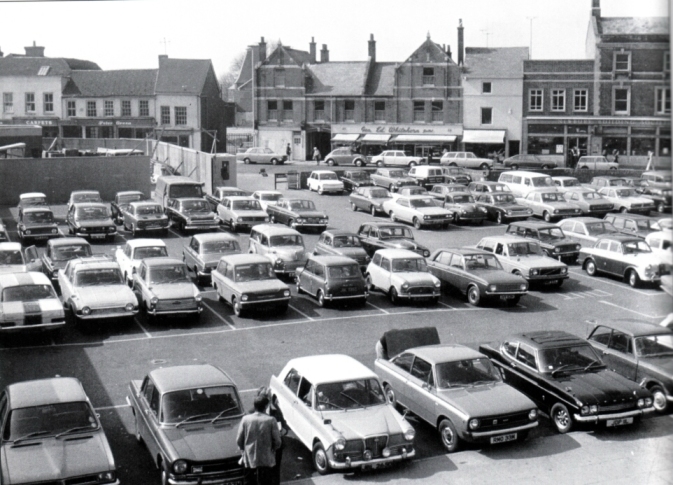 During the late 1960s a number of developments co-incided to raise noise’s profile. Concorde and the ‘threat’ of supersonic aviation was one. The ‘great’ motorway building phase was another. In turn these developments led to new laws focussed on control of construction site noise, occupational noise exposure and principles of compensation for land blighted by these new noise-bearing transportation schemes. Meanwhile technical standards and controls started to appear by which the permitted noise emissions of vehicles and other machines came under control. Noise – for a while – was a very hot political topic. I have a copy of a 1971 book, The Assaults on our Senses by John Barr. Evidently Mr Barr had already made something of a career out of chronicling the way that the modern world was dragging everything to hell, his previous work having been titled Derelict Britain. Barr’s 1971 book attempted a sensory engagement with environmental problems as they were then framed in public consciousness. First, he presented sight and squalor offending that dominant sense. Then he moved on to hearing, and the offence of noise. In doing so he drew a distinction between ‘noise on the ground’ and ‘noise in the air’. In his discourse upon aviation noise Barr was very much ‘of his time’, with anxieties about the imminent introduction of Concorde’s transatlantic flights, the feared impact of its sonic booms upon dairy herds and human mental health to the fore. Evocative campaign groups, long since gone, are name-checked in his book: the British Association for the Control of Aircraft Noise (founded 1966), the Anti-Concorde Project (1967) and the UK Federation Against Aircraft Nuisance (1968). 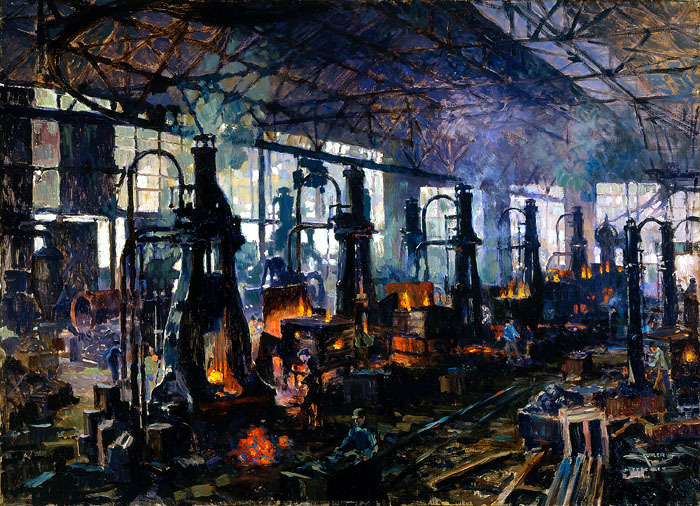 Barr draws a bleak picture of a world drowning in sound, of industrialists rubbing their hands with joy at the productive clamour of their workshops, and of a cacophony of cars. But amidst this assault on noise, Barr momentarily falters, acknowledging the habituation of most to the everyday sounds of life, and chillingly depicts the horror of pure silence, the sensory deprivation of a sound-proofed chamber in which a subject is left alone with only his heart beat, breathing and the movement of his eyelids as acoustic companion. Even Barr concedes that sometimes, some sound may be better than none at all. But like Barr, most of the debate (and legislation) about noise, as originally and influentially framed in the late 1960s and early 1970s, still focuses resolutely on noise as ‘pollution’, noise as something undesirably and that threats to the tranquillity of silence. This approach remains evident in the urban noise mapping required by EU derived ambient noise mapping laws – the map as a register of zones requiring action (‘acoustical planning’) to reduce ambient noise and thereby improve human qualities of life. Silence, and the individualisation of soundscapes was often what these laws and policies espoused. And here I think of Richard Sennett, who portrayed evidence of a widespread retreat from the public realm in his The Fall of Public Man (2003). Whilst he used the notion of individuals retreating into their homes and shutting out the ‘public’ world outside metaphorically, as symptomatic of a wider retreat from living with a public realm, we can actually take this image literally. There was a physical retreat, an attempt to block out the world beyond the private realm of the home: this was the rise of double glazing in the 1970s. Yes the double glazing craze was partly driven by energy efficiency (the 1973 energy crises certainly focussed the minds of homeowners on their spiralling fuel costs), and a vague sense of being ‘modern’ via home improvement – but there was also much made of the new technology’s ability to muffle the home against the noise of the outside world too. It is no coincidence that the raft of compulsory purchase laws made in the early 1970s, and their calibration of compensation principles for homeowners afflicted in the wake of new motorway schemes and airport expansion often offered up double (sometimes triple) glazing as their recompense: the victim fortified indoors in the face of an unstoppable march of concrete laying outdoors. Thus, modernism’s project aspired to a technocratic control over soundscapes, ambient sound as an unwanted by-product of unstoppable progress, an externality, something to be channelled, muffled, designed out by the technocrats, the planners and the lawyers. Yet in recent years due to a congruence of technology and aesthetic sensibilities, some ambient soundscapes have come to be seen as a resource to cherish, a facet of place to characterise and/or an engine of regeneration (the vibrant consumerist ‘buzz’ of the plaza anyone?). 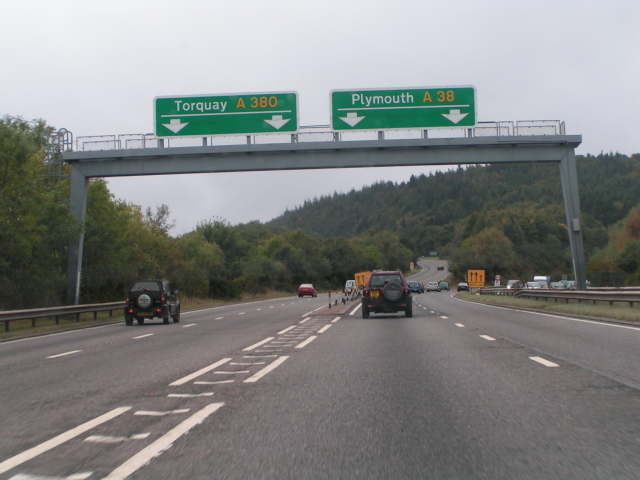 Alongside the established ranks of the motorway scheme’s acoustic engineer and the ‘noise policing’ of Environmental Health Officers we now see poets, ‘sound-artists’ and other enthusiasts attempting to valorise ambient soundscapes. Notable projects have included The London Sound Survey , the British Library’s UK Soundmap project and the Positive Soundscapes Project. These initiatives (and many others) create a strange mesh of acoustic science and aesthetic poetics. There is a conservationist sensibility to the fore here – born of a realisation that soundscapes can be lost for ever. And this sentiment can come to the surface now, because technology enables us to have a realistic stab at capturing soundscapes in a meaningful way. Smartphone apps, social media and digital recorders enable collaborative archival ‘capture’ of samples of soundscapes for posterity, with linking of those samples to maps via geo-coding enabling an interactive place-sound (and time) based interrogation of the aural archive. Perhaps when they are grown up, my kids will be able to salve their adult nostalgic yearning for the lost soundscapes of their youth by logging into one of these archives and re-living the sound-moment courtesy of a passing enthusiast’s carefully executed and geo-logged sampling of the local sound-world outside their bedroom windows earlier today. Barr, J. (1971) The Assaults on our Senses, Sphere: London. Sennett, R. (2003) The Fall of Public Man, Penguin: London.